Edgar Degas : The Horse Races. Before the Start. 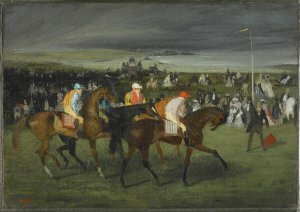 The Horse Races. Before the Start. 32 x 46 cm - 12 9/16 x 18 1/16 in. Atelier Degas - Vente Degas, 1918, I, n° 91 (repr.) - Etienne Bignou, Paris - Léon Orosdi, Paris - Vente Orosdi, Paris, 25 mai 1923, n° 12 - Howard Young, New York - Annie Swann Coburn - Mme L. L. Coburn, Chicago - Cambridge, Fogg Art Museum, 1934 (Don Annie Swan Coburn). The Art Institute of Chicago, 1932, n° 7, repr. p. 37 - The Art Institute of Chicago, 1933, n° 279 - Boston, Museum of Fine Arts, 1935, Independent Painters of 19th Century Paris, n° 11 – Philadelphie, Pennsylvania Art Museum, 1936, n° 6 (repr.) - New York, Wildenstein & Co., 1949, n° 7 - Manchester, Currier Gallery of Art, 1949, Monet and the Beginning of Impressionism - Detroit Institute of Arts, 1954, Two Sides of the Medal, n° 66 - Malmö, Utrecht, Birmingham, Londres, Newcastle, Bruxelles, Liège, 1956-1957, n° 75 - Lyon, musée des Beaux- Arts, 1957, n° 7 - Los Angeles, County Museum, 1958, n° 9 (repr.) - New York, Wildenstein & Co., 1960, n° 6 (repr.) - Hanover, Hood Museum of Art, 1962, Impressionism – Williamstown, Clark Art Institute, 1970, n° 2 - Cambridge, Fogg Art Museum, 1974, n° 23, repr. p. 58-59 - Cambridge, Fogg Art, Museum, 1977, Master Paintings from the Fogg Collection - Londres, Royal Academy, 1979, n° 9.20 (repr.) - New York, Houston, 1994, Degas Landscapes, fig. 53, p. 65-67 - Tobu, Tokyo, 1996, n° 131, repr. p. 183 et fig. 5, p. 173 - Washington, National Gallery, 1998, n° 13, repr. 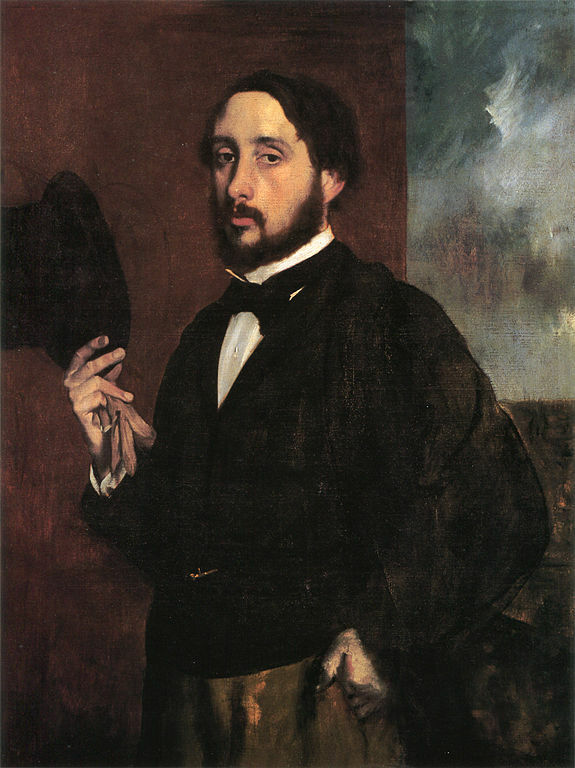 p. 46 - Cambridge, Fogg Art Museum , 2005, Degas at Harvard, fig. 19, repr. p. 4. Manson, 1927, p. 37, pl. 26 - Catton Rich, Cat. exp. Chicago, 1993, p. 41, n° 279 - Lemoisne, 1946-1949, II, n° 76, repr. p. 39 - Haverkamp-Begemann, 1964, n° 76 - Beaulieu, 1969, La Revue du Louvre, XIX, p. 370 - Carpenter, Cat. exp. Fogg Art Museum, Cambridge, 1974, cat. 23, p. 58-59 - Connor, Lambourne, Cat. exp. Royal Academy, Londres, 1979, n° 9.21, texte p. 90 (repr.) - Fernandez, Murphy, 1987, Degas in the Clark, fig. 12a, p. 12 - Eitner, 1988, II, p. 165, fig. 28 - Boggs, Cat. exp. Paris, Ottawa, New York, 1988-1989, fig. 51, repr. p. 102 - Bowron, 1990, n° 327, p. 104, 239 (repr.) - Kendall, Cat.exp. Degas Landscapes, 1993, fig. 53, p. 65-67 - Boggs, Cat. exp. national Galley, Washington, 1998, n° 13,p. 14-15, 35-48 (repr.) - Dumas, Brenneman; Cat. exp. High Musuem, Atlanta, 2001, n° 13, p. 108-109, repr. p. 30 - Spate, 2000, p. 28-31 (repr.) - Wolfe, Museums Boston, printemps-été 2005, IX, n° 1, p. 59 (repr.) - Degas at Harvard, 2005, fig. 19, repr. p. 40 - Reed, Harvard Magazine, juillet-août 2005, vol. 107, n° 6, p. 40-45 (repr.) - Cohn, Boggs, Cat. exp. Cambridge, 2005, p. 39, repr. fig. 19, p. 41 - Clarke, Cat. exp. Sterling and Francine Clark Art Institute, Williamstown, 2013, fig. 42, p. 68 - Chantilly (Domaine), Jeu de Paume, 2018, fig. 55, repr. p. 143.